2004 Sierra 1500, 178,829 miles, options include: Chrome Wheels, Multi-zone Climate Control, Cloth Seats, a Spare Tire (Full Size), Front Tow Hooks, Rear Wheel Drive, Daytime Running Lights, an Auxiliary Power Outlet, a Gasoline Engine, Anti-Lock Brakes, Disc Brakes, Cruise Control, an Adjustable Steering Wheel, Air Conditioning, a Bench Seat (Split), a Drivers Air Bag, an AM/FM Stereo, Intermittent Wipers, a Passenger Air Bag Sensor, a Single-Disc CD Player, an Auto Headlamp, a Passenger Air Bag, Power Steering, a Reading Light(s), and a Tilt Steering Wheel. 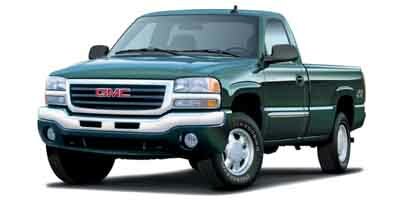 This 2004 GMC Sierra 1500 Reg Cab 119.0" WB, Stock number 8577 features a Sport Red Metallic exterior. Factory equipped with an impressive 6cyl, 4.3l, 195.0hp engine, an transmission, 4-speed automatic, electronically co transmission and rear wheel drive, this GMC Sierra 1500 is ready to conquer the roads! Contact us today to schedule a test drive of this 2004 GMC Sierra 1500 Reg Cab 119.0" WB! Or stop in at 520 East Main Whiteland, IN to check it out in person! This awe-inspiring vehicle as well has Multi-Zone Climate Control, an Auxiliary Power Outlet, and Single-Disc CD Changer. Additional Options: Texas/oklahoma/louisiana Base Package / Includes (aj1) Glass, Solar-ray Deep Tinted, (k47) Air Cleaner, High Capacity, (au3) Door Locks, Power Programmable And (lu3) Engine, Vortec 4300 V6 Mfi. Additional Options: Power Windows And Mirrors / Provides Power Driver And Passenger Front Side Windows On A Base Trim Level, Includes Lh And Rh Outside Power Adjustable, Manual Folding, Non Heated Mirrors And Up Level Door Panels. The Mirror Head Is The Same Size And Configuration As The Base Power Mirror On Ls Decor.